The Pianola Institute Inaugural Concert - December 1985. Since 1972, there have been pianola concerts at London's South Bank, re-instating a tradition first established at the outset of the twentieth century. Public recitals with pianolas and reproducing pianos were an important part of the publicity surrounding the various brands of player piano. As is often quoted, the London Symphony Orchestra accompanied Easthope Martin in 1912, as he pedalled his way through the solo rolls of the Grieg Piano Concerto. Reginald Reynolds, his successor as chief pianolist to the Aeolian Company in London, gave many recitals all over Great Britain, and also on the Continent. Similar concerts took place in the USA and elsewhere - see our Pianolists page for brief details. 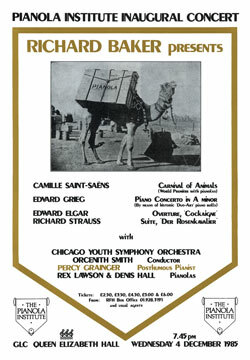 When the Pianola Institute was launched in 1985, it invited the Chicago Youth Symphony Orchestra to perform in London's Queen Elizabeth Hall, in an inaugural concert featuring various types of player piano, introduced by the well-known British television personality, Richard Baker. Since then the Institute and its members have presented many concerts in Britain and abroad, of both pianola and reproducing piano performances, and sometimes with the aid of singers and instrumentalists. These pages will give you a flavour of some of these activities. Also in this section are details of the Pianola Institute's CDs. Click on the Institute Recordings link in the side menu for more information. If you would like to be placed on our concerts and recordings mailing list, please fill in the form here, or email concerts@pianola.org.